ThePrint is pleased to join Indian Novels Collective as its Digital Partner. Indian Novels Collective is a not-for-profit network of individuals which is launching an initiative to bring classics of non-English Indian literature to English readers. The partnership will see ThePrint covering and sharing on its digital and social media platforms events organised by the Collective. 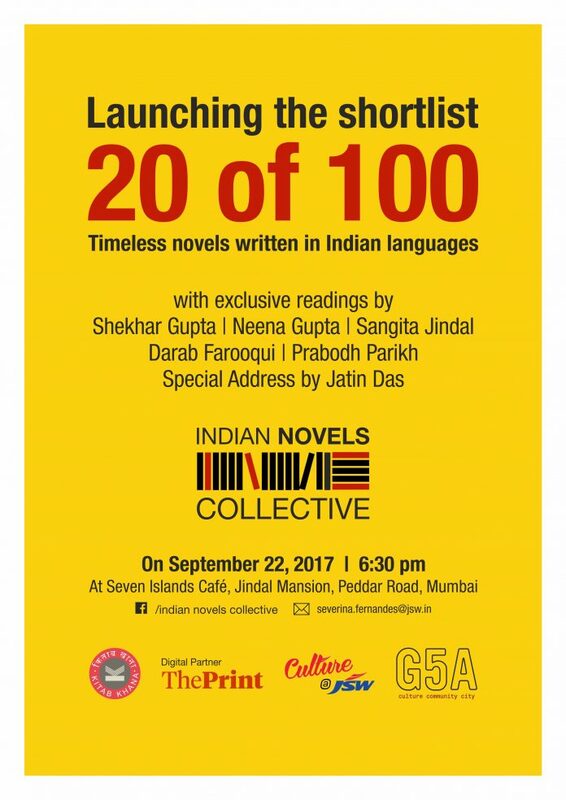 Indian Novels Collective will open on Friday, 22 September, in Mumbai with the launch of the first shortlist of 20 out of 100 timeless novels written in Indian languages. The launch will be followed by exclusive readings from the shortlisted Hindi novels by ThePrint Editor-in-Chief Shekhar Gupta, actor Neena Gupta, JSW Foundation Chairperson Sangita Jindal, and writers Darab Farooqui and Prabodh Parikh. Painter Jatin Das will deliver a special address at the event. Subsequent events include readings of novels from other Indian languages in Delhi and Mumbai. The core group of Indian Novels Collective includes Sangita Jindal, Mumbai book store Kitab Khana owner Amrita Somaiya, TISS professor and poet Ashwani Kumar and Anuradha Parikh, founder and artistic director of G5A Foundation for Contemporary Culture. Shekhar Gupta is among the mentors of Indian Novels Collective.